The Little Church That Does! 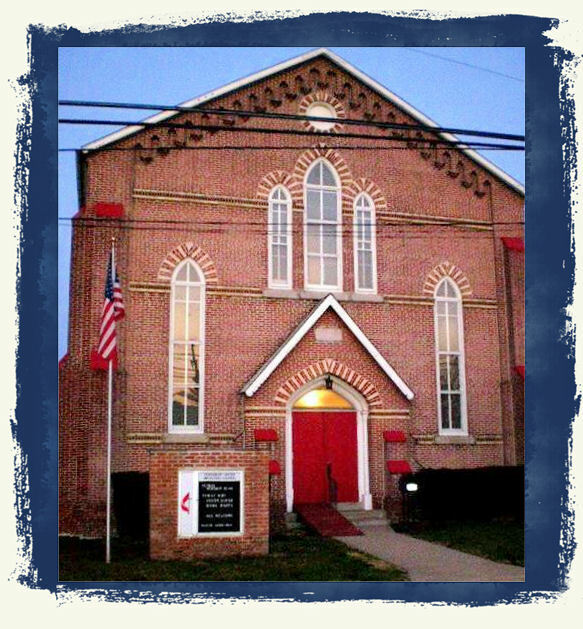 Cokesbury United Methodist Church envisions itself as the village church, sharing God’s love with the community of Marcus Hook, and globally, through worship, education, and service. To grow together in our love of God. To be witnesses to the joy of a life centered in Christ. To make a positive impact on the well being of the community. To support the global church. Our church serves the area of the Chichester School District. We are located in Marcus Hook, PA - the most southeastern community in the state. Current census data shows a population of 2,420 with a median age of 32.5, a median income of $37,961, and a poverty rate of 19.2%. From a statistical perspective, this is who we are; however, our town is rich in history and lore. The area was originally home to the Lenape nation. In the 1640s, the first Swedish travelers arrived. The area then passed to the Dutch and then the British as a result of war. The Dutch gave the settlement its name, Maartes Hoeck. Maarte was a Lenape chief who lived at the hook in the Delaware River - the same location as the town. The name became anglicized to Marcus Hook over the years. Being a river town, Marcus Hook was a favorite port of call for pirates in the 1700s. Legend has it that a Plank House in town was the home of Blackbeard's Mistress. 2nd Street was fittingly named "Discord Lane" during the pirate era. Every September the Marcus Hook Preservation Society holds a Pirate Festival to celebrate this part of our history. Legend holds that Marcus Hook was part of the Underground Railroad in the 1800s. People have found what appears to be tunnel entrances in the basements of old homes leading to speculation about pirate smuggling and the Underground Railroad. Industry came along in 1902 with the Sunoco Refinery being built along the Delaware River. In 1910, American Viscose built a plant in Hook to produce rayon - then called artificial silk. American Viscose also constructed a model village for its workers and management. This neighborhood of 260+ houses is still very much in use today. Long time residents (also known as "Hookers") refer to this neighborhood as "The Village". Methodism in Marcus Hook actually predates the birth of the nation due to the efforts of British Army Captain Thomas Webb, one of John Wesley's converts in England. Wesley said of him, "He is a man of fire and the power of God attends his words." In 1833, Rev. Brooke Eyer led the first Methodist class meeting in town. A second class was formed and both classes met in various locations including local taverns, homes, and front lawns. As the classes increased in size it became necessary to consider building an official meeting place. In 1837, a one story building with a simple platform, plain wooden pulpit, and wooden benches was built on Second Street (Discord Lane) for a cost of $200. The name chosen for the church was Cokesbury in honor of the first American Bishops, Coke and Asbury. A charter was granted in 1869. The corner stone of the present building, at Market and Plum Streets, was laid July 6, 1871. The parsonage was built in 1885. Our church has been part of the community during boom and bust. In spite of the changes, Cokesbury has remained active and involved in the life of the community. Many who are active in the life of the church are also active in the firehouse, local politics, and the community in general. The church has always had a heart for ministry and has opened its doors to embrace and include the community. Over the years Cokesbury has hosted Head Start, Girl Scouts, a Tutoring and Homework program, a lunch time Bible Study for local industry, and currently, a recovery group. We have also always been a polling place. For many years we have run an Emergency Food Pantry which provides non-perishable groceries to families in need. Cokesbury has also responded to needs outside of our immediate community in various ways such as: making emergency kits for victims of hurricane Katrina, donating to the tsunami relief efforts, providing Christmas gifts to a local nursing home, and participating in Operation Christmas Child's shoe box ministry. Ministering to the children of the community has always been a particular passion for Cokesbury. The church runs a Vacation Bible School each summer which is extremely active, engaging, and greatly anticipated in the community. We have also had an active Youth Program over the years. We are part of the South District of the Eastern Pennsylvania Conference.